Our collection of games like Machinarium offers other point and click adventures for fans of the game and the genre in general. 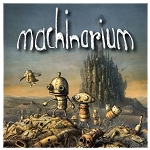 Machinarium launched in 2009 and is a quirky puzzle game that uses a point and click interface. This old point and click style approach gives it a feel similar to many classical games in the genre and brought fresh life into a genre that was rarely touched upon in modern times before Machinarium and the games it inspired. The most unique element to gameplay in Machinarium is the distinct lack of dialogue which forces players to learn about the game world and its available mechanics by themselves which adds to the overall adventure experience. Players aren’t left to tackle the game alone though thanks to the hint system centred around a mini-game which helps to provide some direction. The games like Machinarium found here focus on other point and click puzzle adventure games with an emphasis on games that offer something unique and outside the box. The games below include options for PC, iOS and Android devices along with free games like Machinarium for gamers on a tight budget.